I have never resented a fall as much as this one. Don’t misunderstand me – it has been beautiful. James keeps on moaning that it isn’t as beautiful as it was last year, but I disagree. Fall on Capital Hill is stunning. The leaves frame the already colorful houses and everyday when I go running I am overwhelmed by how the autumn rainbow. So why am I so resentful? Because other than running, I have pretty viewed this fall from behind closed windows. I see fall pass by outside, and I resent school from keeping me from it. Every weekend I have intended to go to Arlington, or a local state park, and every weekend I find myself reading books and writing papers. (Or REwriting them, as was the case this weekend after my laptop was stolen in the metro this past week.) Outside of my office window I have been watching a tree slowly change colors, and I am sad to say that they are now falling. Another autumn almost gone. 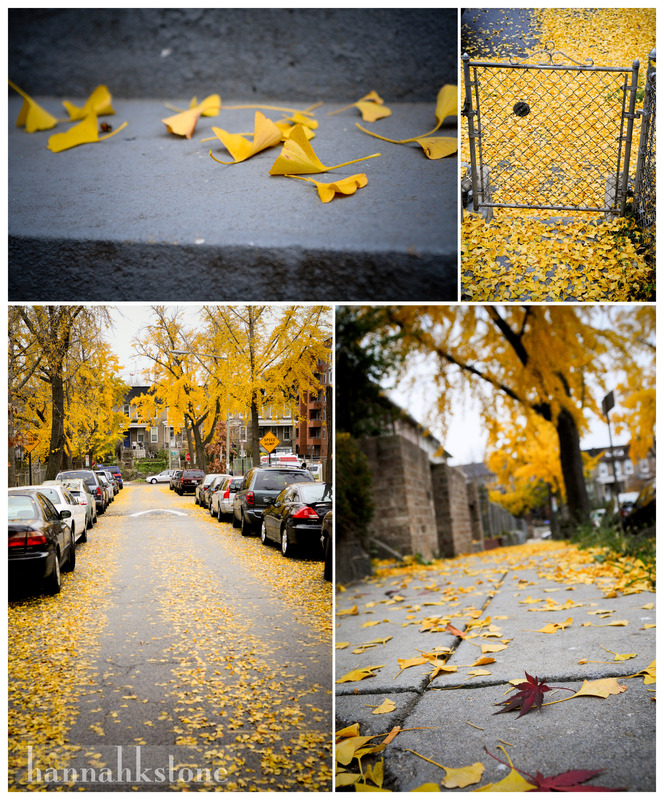 Our street is lined with gingko trees, the most lovely of all fall trees. After a storm earlier this week, our street is now paved in gold. I was working away on Thursday, but finally I decided I had to go get some pictures of this yellow rug before it is gone. Saturday morning, I was moping around re-starting all of my final papers (which had been carefully researched and outlined out before the infamous computer heist which I will not mention again, I promise) and I was watching both of my roommates head out into the beautiful fall day. They both are such epitomes of style that I chased them outside in my pajamas to get some fall style pictures before resigning myself to a long day inside. Liz, off to work wearing the world’s most wonderful scarf and some good stripes. I am banning myself from any more stripes as they constitute half my wardrobe. Instead I shall start stealing Liz’s. 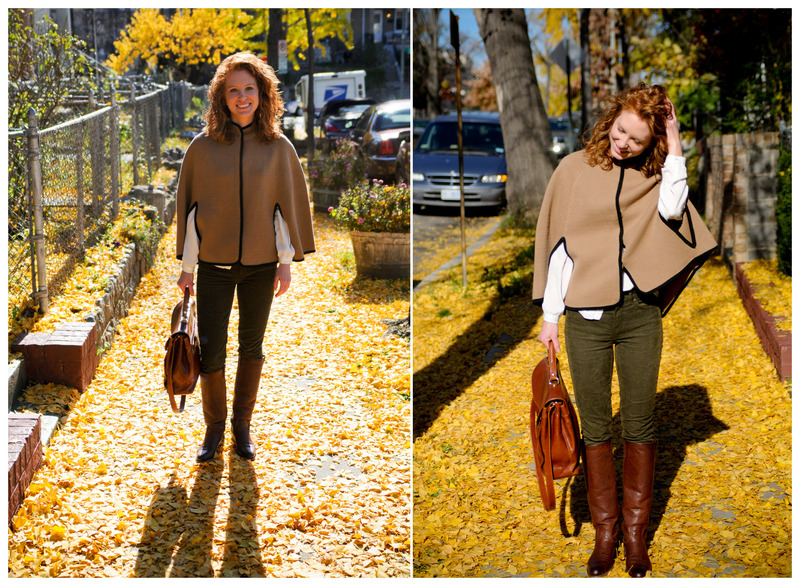 I think you can only pull off the equestrian cape look if you are a teeny tiny redhead from Texas. Also, Sarah has given my life new meaning: acquire Frye boots. May you all enjoy the last days of fall. And may you look stylish while doing so. This entry was posted in Uncategorized and tagged beauty, colors, fall, fashion, friends, school, seasons, style, yellow. Bookmark the permalink.